One of the most feared weapons of World War II, the Tiger tank was a beast of a machine which dominated the battlefields of Europe with its astonishing size, speed and firepower, which continues to fascinate more than 70 years after it was first designed. 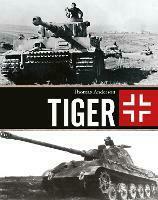 Revealing its design and development history, Thomas Anderson draws upon original German archival material to tell the story of the birth of the Tiger. He then analyzes its success on the battlefield and the many modifications and variants that also came into play. Illustrated throughout with rare photographs and drawings, this is a unique history of what is easily the most famous tank ever produced.